Crispy, crunchy, and packed with authentic flavour, our Protein Pork Crunch is a new protein snacking experience, and the perfect lunch box companion. Great-tasting, super-convenient, and high in protein — enjoy on the go to keep your training on track. 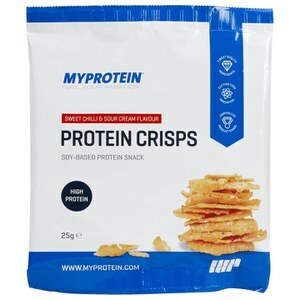 When to enjoy Protein Pork Crunch? Whenever, wherever — get the protein you need in a deliciously tasty way. What to enjoy Protein Pork Crunch with? Protein Pork Crunch is the tasty, protein-packed way to top up throughout the day — but to make sure you begin your day in the best way possible, wake up with our Complete Breakfast Blend. It’s loaded with protein and essential vitamins to get your morning off to the ultimate start. Store in a cool dry place, away from direct sunlight. Once opened consume within 1 day. Not suitable for vegetarians. I fancied trying something, and for a quid, might as well as I was buying other stuff. They're like quavers rather than pork scratchings. They taste good, and the amount of protein compared to carbs and fat is awesome. Would buy again. I couldn't believe my taste buds when I tried these the flavour and texture is really on point. Crisp and taste exactly like pork crakling. Size of packet is just right for a snack that is satisfying. Go very well as croutons broken up in pieces over a salad. I never really like pork scratching because of too much soft fat but these are like crunchy thick quavers ideal when your craving.